Nothing like some turbocharged five-cylinder fun. There was a time when we were uncertain whether Audi would bring its latest TT RS and RS3 sedan to the US. Fortunately, the German automaker has delivered, and now it’s time to discuss pricing. Car and Driver managed to get a hold of Audi’s official pricing for both hot cars. 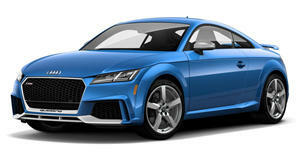 The new TT RS will carry a starting price of $66,875. Expensive? Yes, but C&D also points out that, compared to the Porsche 718 Cayman S, the TT RS has an additional cylinder, 50 more hp, and costs $1,750 less. Standard fare includes 19-inch wheels, Nappa leather, eight-way power sports seats, LED headlights and a fixed rear spoiler. Optional features include 20-inch wheels, carbon ceramic front disc brakes, a red diamond interior stitch patter, Bang & Olufsen sound system, Audi Connect 4G LTE, and Apple CarPlay and Android Auto. Then there’s the RS3 sedan, which would be our preference between the two. Why’s that? For starters, it costs less, beginning at $55,450 for 2017 models, and $55,875 for the upcoming 2018s. And yes, the carbon ceramic front brakes are optional here as well. 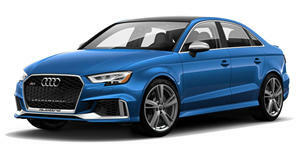 But if you have to have one of the first 2017 RS3 models, then Audi has already made them standard with the following: carbon fiber inlays, Bang & Olufsen sound system, 19-inch five-spoke wheels with a sweet titanium finish, red brake calipers, the automaker’s MMI Nav Plus system, and even a black-tipped RS sport exhaust. Happy driving.